X-Rite has answers. Our MA96 spectrophotometer is an intelligent, hand-held tool with the power to provide precise, reliable data on special effect coatings, including data from a -15 degree angle. Through a series of pressure sensors, the MA96 is able to consistently produce accurate readings on flexible and curved surfaces. We've made it easy to use, too. There's a large color LCD screen for reading data or measurement directions, and options for USB or Bluetooth wireless data communication A more powerful version of our MA94 and MA68II devices, MA96 operation is enhanced by exclusive advantages, such as X-ColorQC® software that enhances process recording, reporting, and control and a JOBs software mode that allows text or visual measurement direction to ensure consistency. All in a few keystrokes. So now, the only limit to working with special effect finishes is your imagination. -15 degree aspecular vieing angle. This angle is on the opposite side of specular to more fully characterize interference pigments. Accurate, repeatable sample positioning. Innovative user selectable pressure sensors ensure consistent sample interface on flexible or curved surfaces. Portable, lightweight. The unit weighs a little more than a kilogram, making it ideally suited for long-term use without discomfort. Rugged design. Engineered to withstand demanding production environments. Supported by an unprecedented two-year warranty. 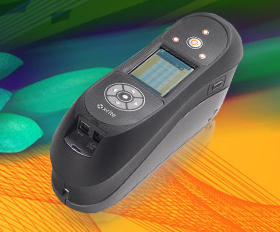 Bundled with X-Rite's exclusive X-Color QC™ measurement and analysis software. Quick reads. Consistent measurements are achieved in 2 seconds. Universal functionality. Universal menu icons simplify usage while eliminating language barrier. Program measurement position and sequence. Through software JOBs mode, workers can be given text and/or visual measurement directions to ensure consistency of measurement from shift to shift. Increased lamp life, reduced battery consumption. Improved illumination efficiency, results in reduced power consumption from the lamp, allowing up to 750 reads from a fully charged battery. Compatibility with previous X-Rite instruments. Maintaining similar optical configurations from previous generations of X-Rite instruments provides compatibility with existing data. International standards ready. Meets DIN and ASTM standards: ASTM D 2244, E 308, E 1164, E 2194; DIN 5033, 6174, 6175-2; ISO 7724; SAE J1545.